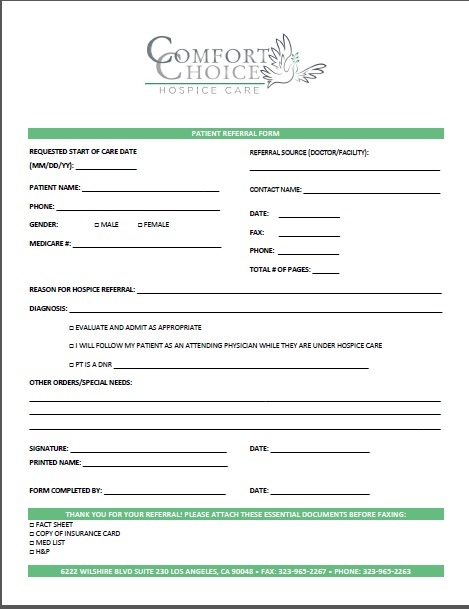 Thank you for considering Comfort Choice Hospice as the next step for your patients. As a company that is dedicated to providing the highest quality hospice care possible, we thank you for your referral and your trust in us as the best choice for the continued care for your patients. Should you have any questions concerning our services, do not hesitate to contact us by calling 323-525-0070 or by filling out our online contact form. We will be happy to answer any of your questions concerning our hospice care. As the next step in patient referral, please download a copy of our patient referral form by clicking on the image below.